Custom hand painted original oil portrait painting. The left is picture and the right is real painting, you can see the quality. We do all kinds of oil portrait, the subject such as family, wedding,children, pet, landscape, house portrait and etc. How to custom oil portrait painting ? ►Step 1, Send the pictures you would like to be painted to our mail: order@buy-painting.com,tell us the requirement and etc. ►Step 2, You done the payment,just need 50% advance deposit. In usually,the painting will be finished around 7-15 days. ►Step 3, Once the painting been completed,we will send you photos of finished paintings to confirm, after you confirm it, we will ship it out. 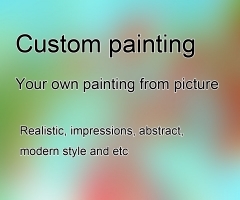 Why custom painting from us ? ►Competitive price guarantee with best quality. ► Any images,any sizes,any creativity can be painted. ► 100% hand painted oil painting on canvas. ► Fast Delivery guarantee.Within 7-15 working days, your order will be completed and shipped.And worldwide shipping available. ► Refund & replacement guarantee. Following is the price for the portrait in different size,if you need other size,please tell us. One figure means one people, one dog or one cat. Following is the price for different size. For example,1 people and 1 dog means two figures, 1 dog and 1 cat means 2 figures. Here are some samples as a reference to calculated price for you. You can see more samples at this link, More Pet Oil Portrait Samples.